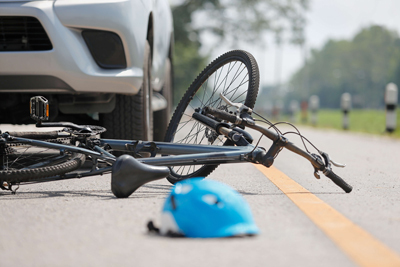 After a bike crash with a vehicle, you’re probably going to talk to at least two adjusters: one from your insurance company dealing with your medical bills, and one from the driver’s insurance company. Keep in mind you should be as honest and forthright as possible with the adjuster for your insurance company. Never misrepresent what happened as it can create a distrust with them. This is one of the primary business tactics of an adjuster representing the other driver’s insurance company. There are several companies who regularly make it a practice to contact someone after a crash and encourage them to accept $1000 or $1500 to settle their case before talking to an attorney. I’ve talked to many people over the years who didn’t realize the extent of their injury and accepted one of these token settlements only to realize later they needed a surgery and could do nothing about it. They had signed a release of all claims in exchange for a small amount. Insurance companies realize quick settlements save them a ton of money. Insurance companies love to use information about prior injuries to reduce the value of your present claim. Prior injuries are a legitimate concern and can affect your current claim. You simply do not want to get into a conversation with the claims adjuster that allows them to pry into your prior medical history at an early stage after your injury. Don’t let them take advantage of your medical history. Insurance Adjusters Will Ask About Your Injuries. Don't Answer Them! This is probably the most common tactic we see. Many people tend to downplay the significance of their injuries until they realize its full extent later. When you tell an adjuster “it isn’t that bad” or “I think I’ll be okay” or “I’m not having a problem with my back” it will hurt your claim if your injury persists or becomes much more serious as the days and weeks progress. Later claiming the same injury is much worse makes it sound like you’ve changed your story. They will use your earlier description against you. What Questions Do Claims Adjusters Ask? Could you have done anything to avoid it? Did you decline emergency medical care at the scene? When did you first see a doctor and who referred you to the doctor? If you agree to give a recorded statement to a claims adjuster, you need to be truthful. It generally is not in your best interest to volunteer subjects you were not asked. They will probably ask you things you weren’t expecting. You must never assume the other driver will be honest or agree with what you recall. If you simply don’t know how the crash occurred, they may rely on the other driver’s version and assume it is accurate. If you have any questions about your cycling crash or whether to give a statement to a claims adjuster, we are ready to take your call. It means a lot to us to be given the chance to help you. If you’ve already given a recorded statement and you’re concerned you might have fallen for one of these tactics, it’s okay! You’re dealing with a lot of things you’ve never faced before, all while seeking the best recovery from your injuries. We’re here to help you get compensated fairly and justly. Please contact us online or call our office directly at (888) 207-0905 to schedule your free consultation.